Our house is not just a building with four walls – it’s our home base. It’s where we go for comfort and peace at the end of a busy day. 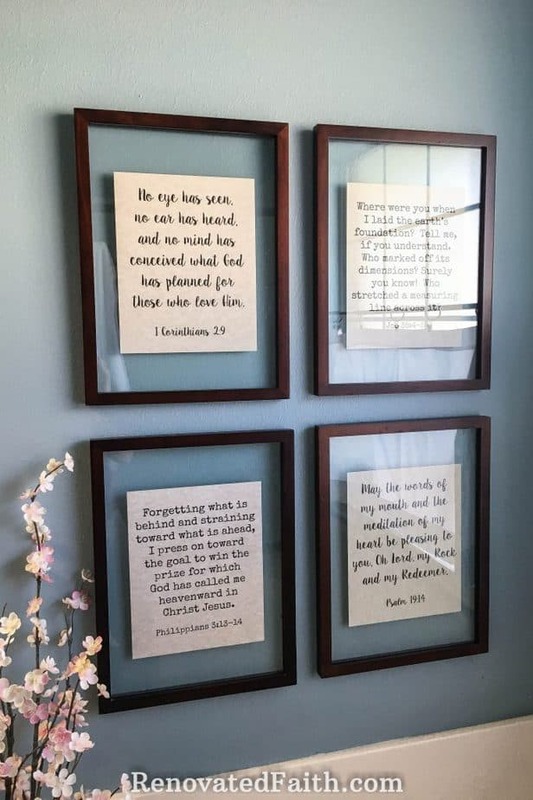 Decorating your home with built-in reminders of God’s faithfulness can be a such a source of encouragement. 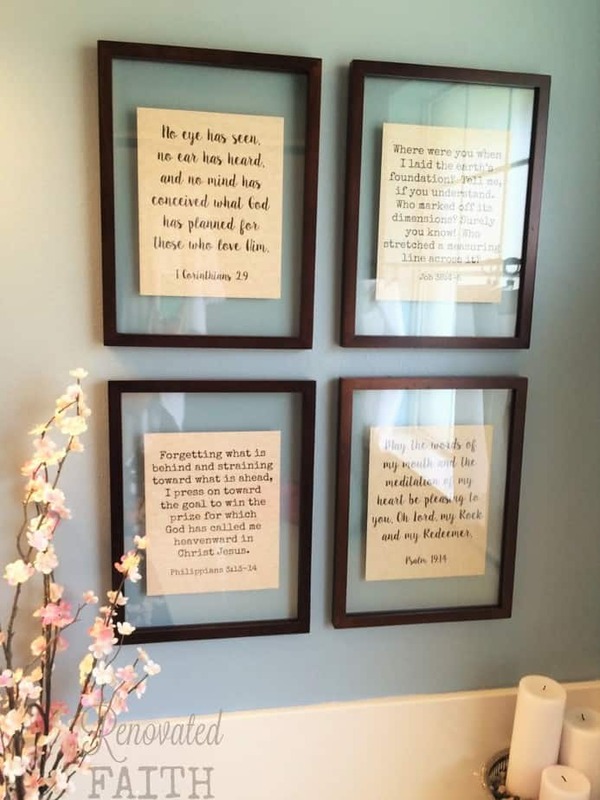 For that reason, I put some of our favorite Scripture verses in these DIY Floating Picture Frames in our bathroom. My husband and I each picked two as a reminder that God is the unshakable foundation of our hearts and home. After removing a brass towel bar and painting the bathroom, I contemplated what to hang on the wall over the master bathtub. I knew whatever I displayed should be relaxing and enjoyable for the end of a long day. Although a flat screen TV was very tempting, I decided to frame some verses that meant a lot to Jeremy and I. 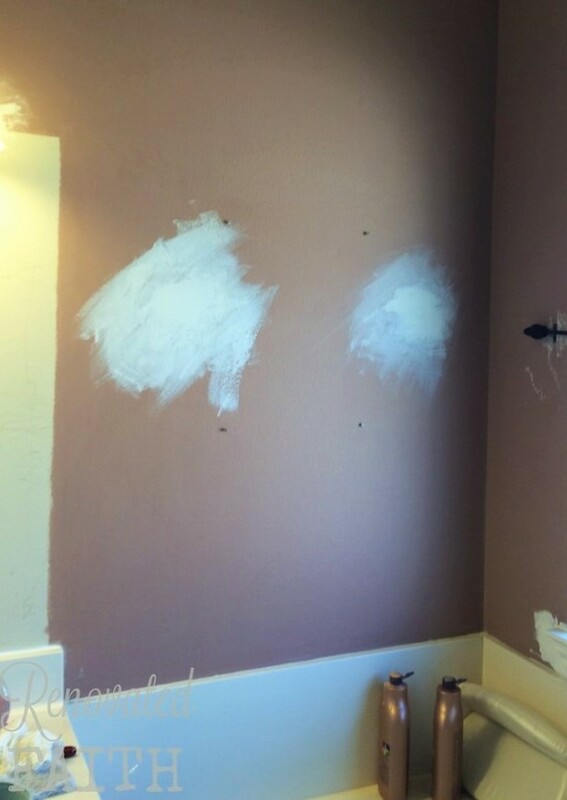 We each picked two in order to add a personal touch to our bathroom (Light and Airy Master Bathroom Makeover). These verses are special to us because they are not just informative words on a page but they serve as directional markers on a map, pivot points that show us how to find our true North. The world and even our hearts can be very deceiving, but one thing holds true – no matter your country, social status or salary, the Word of God pierces our hearts the way nothing else can or does. Along with countless others, these truths represent defining moments in our lives where God illuminated His Truth to us. We carry them with us, not just on the wall of our bathroom. We hold them in our hearts to know the depth, height and breadth of a loving God who actively leads His children along life’s perilous journey. When my heart betrays me, I find solace in the truth of His Word that is alive and active, sharper than any double edged sword. God continually works in the hearts and minds of His children through the truth of His Word. Not just initially, as a book laid on the coffee table of eternity, but God perpetually uses His Word in the DAILY lives of His children. He guides and cares for them as a shepherd cares for his sheep. 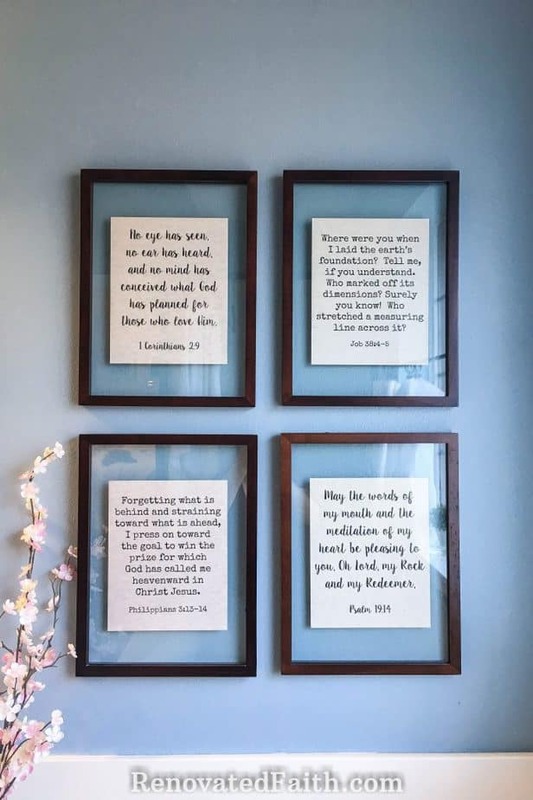 When I look at these transparent frames, I know these verses are not just words in a frame to merely be read. Their purpose is to be embraced. They are to be trusted, knowing the Author will catch me every time I fall. I had a large space to fill in our bathroom which is why small frames are great. They make a large wall space interesting while they are also inexpensive. 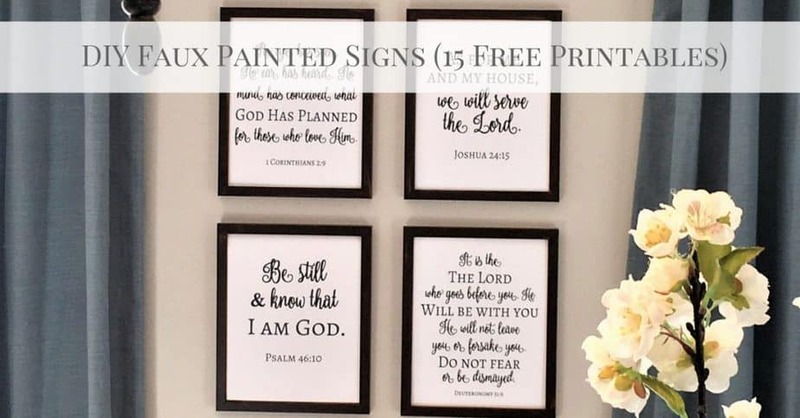 Four CHEAP 11 x 14 picture frames from the dollar store – you will only need the glass from these! Card stock of any collar. I used a tan with an antique-y (is that a word?) finish from the scrap paper section of the craft store. What you don’t see in the picture is that there are actually two pieces of glass. They suspend my verse art in the middle of the frame to make the DIY Floating Picture Frames. First, make your wall art. I did mine in Microsoft Word and cut them to size with my paper cutter. The two verses that Jeremy picked are in a typewriter font (Special Elite) and my two are in a script (Ballerina in bold). Take the 11×14 piece of glass out of your dollar store frame. (You will not use the frame part, just the glass). Clean the glass with glass cleaner. Once it is dried, place your art on the top and fasten it with double sided tape underneath the art. Readjust as needed to get it in the center. Now open up your “nicer frame”. Lay it face down and take out the backing. Clean the glass in this frame also. Finally, add the other piece of glass so that the art is sandwiched between the two pieces of glass. Refasten the pack of the frame and wipe off the dry erase marks on the front. How do you think it turned out? These verses each have special importance to us. Seeing them daily is a strong reminder of God’s continued faithfulness in the future. I’d love to hear what verses you would choose! If you like these frames you might also like my DIY Faux Painted Signs. You can get the look of painted signs without the hassle and time of painting them yourself! Free printables included. If you want to save this for later, pin it here! Thank you so much Teddy! What a compliment. If you go to the main homepage, go to the bottom right and you’ll see a place to sign up to subscribe to the newsletter. When you do that you will get a link to all the free printables. Let me know if you have any trouble and thank you again! I really love these and am going to make these if I can find the supplies! Thank you for sharing! Thank you so much Lil! Let me know if you have any questions. I love this! I have been noticing my kindergartener going around to all of my wall decor and copying the words into his notebook. How awesome if he could be copying scripture and not even realize it. I’m doing this for sure! What a fabulous idea Ally! I can’t think of anything better for him to copy. Thanks for stopping by! These are gorgeous , and I love the verses! 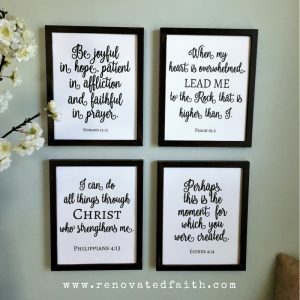 Decorating with God’s Word is a great way to infuse it into your life! Thank you so much Abbey! I totally agree – our homes should reflect the intentions of our hearts. Thanks for stopping by. You can add a picture hanging bracket, one of the saw-tooth type to the back of the frame if there’s not one there. Let me know if you have anymore questions! Beautiful! 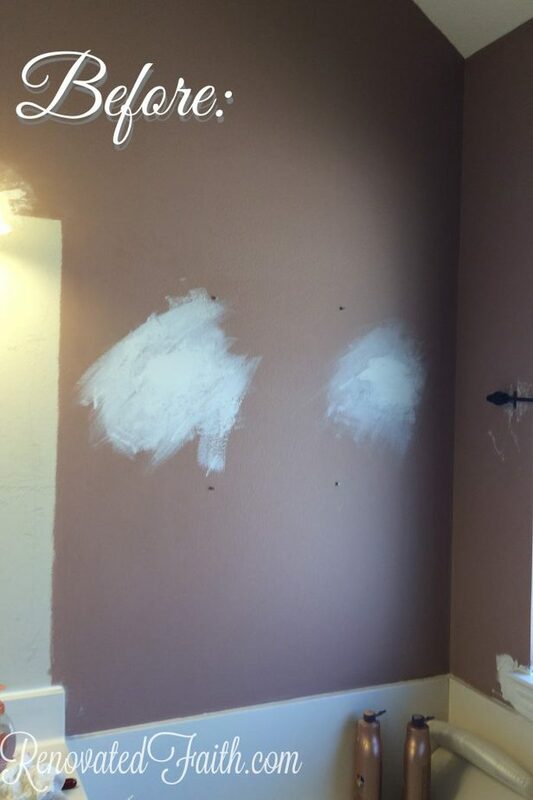 Do you happen to know the paint color on your wall? I love that blue! Beautiful and God’s word is so good. Larissa – I was just reading and enjoying your blog the other day! Thank you so much for taking the time to read my post. Hopefully we can meet face to face sometime in the future. It’s so refreshing to see you use your blog to not only help women but to be bold about your faith.